The fun continues! After doing some shopping and wandering with Margaret in Part 1 of this series, our next adventures involved being flexible with weather and activities. Here’s how it all played out. One of the things I love about Margaret is her ability to just roll with the punches. Day 3 definitely handed us a few punches that needed rolling with. We got a late start to the day after getting the Shermaniñas off to school. It seemed like it may or may not rain so we continued to debate about our plans for the day. 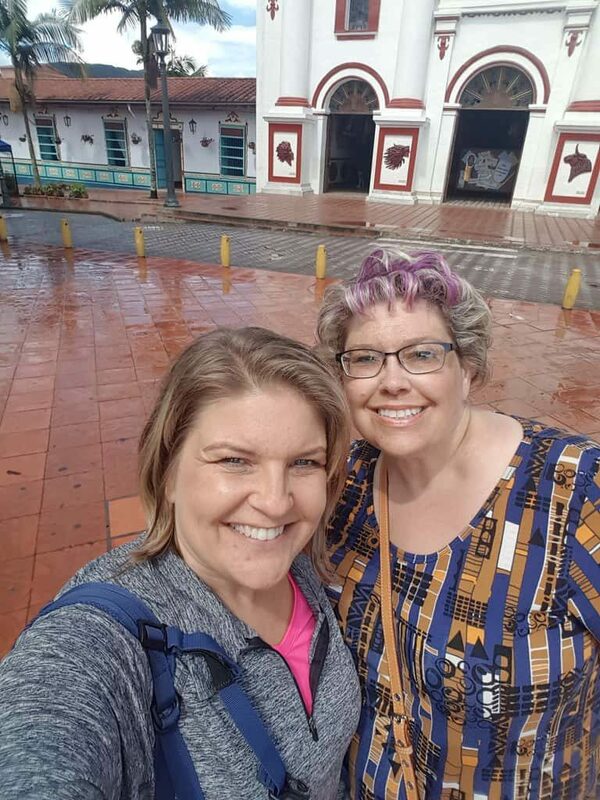 We finally set off around 11 a.m. to get coffee from the nearby Juan Valdez cafe, and then check out a mall and sweet neighborhood called Provenza. Wait, what? Well, I wasn’t totally surprised. We are in the process of applying for longer-term visas, and Dan’s had been approved the previous Friday. 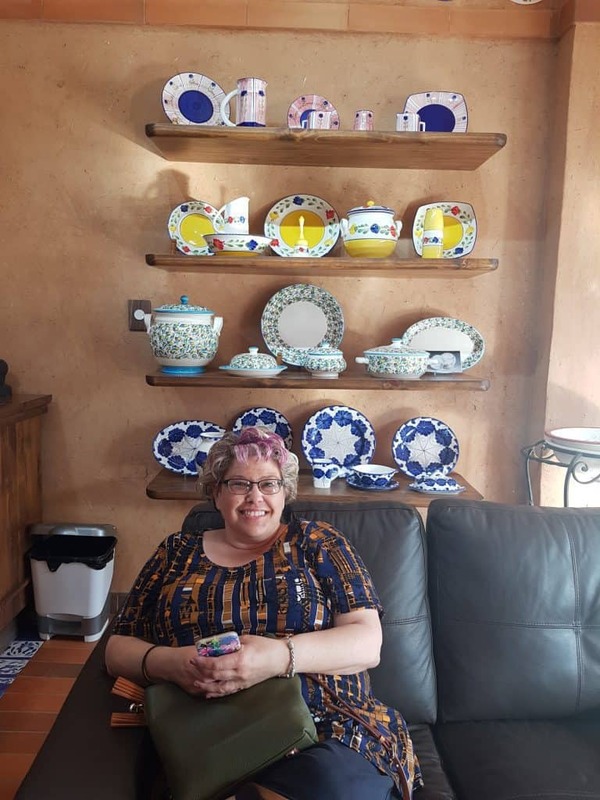 But as we wait for the dependent visas for the girls and I to come through, we were also bumping up against our 90-day tourist visa expiration. The tourist visa is not difficult to extend online nor in person at immigration, but you usually make an appointment for it and come with all the proper paperwork to make it efficient and easy. We did none of those things because we thought our other visa would come through before needing to extend our tourist one. In true Worldschooler FSO style I contact the girls and said “get out of class I’m coming to get you” and Mar and I hop in a taxi. I direct the taxi to the school and then Mar waits in the taxi while I go get the girls. When I come back after a convoluted process of extracting them from school, I see Mar in the taxi gesturing wildly in an attempt to communicate in Spanish with the taxi driver. Turns out they had a nice conversation about religion while they waited. So off we go to our apartment, where I drop off Margaret, send the girls in to get their passports, change clothes, get a snack and bring anything they want for a long day of waiting. They have been in this situation before so they grab phones and headphones and a backpack full of snacks. I instruct Mar to entertain herself on the Wifi and off we go to immigration. Margaret provides reports of Daniel getting very frustrated trying to print the volumes of various important forms that we might need and manage the online process. Doing visa stuff under a time crunch is the worst! I won’t bore you with any more details but suffice to say that at any given moment we were not sure we’d get the visa extension that day. 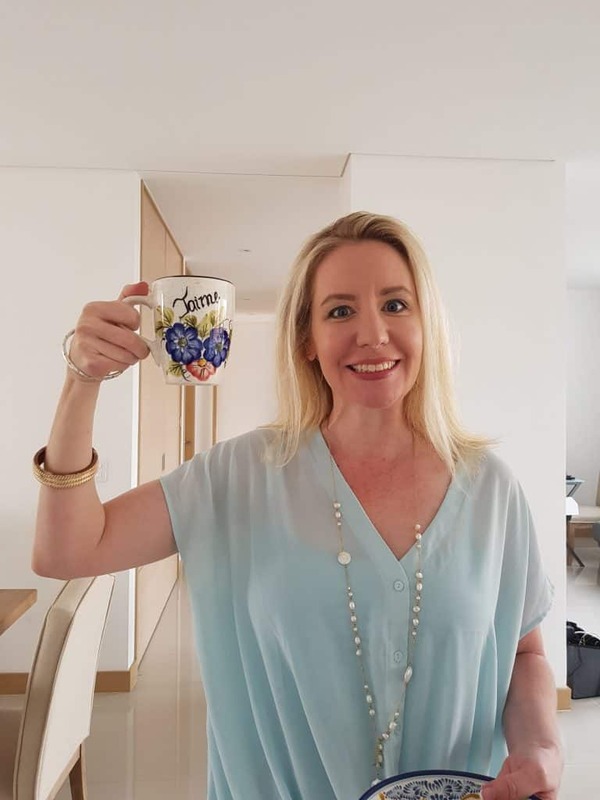 We didn’t have the right paperwork, their online portal that they wanted me to use was not working, we didn’t have an appointment and they didn’t seem at all interested in seeing Dan’s visa paperwork that was on his phone but not in his passport yet. In addition to this, it was getting to be late afternoon and they were starting to take their last customers of the day. A lot of people think that, as Americans, we can go anywhere and stay as long as we want but that’s not at all true. In Colombia we can stay 180 days out of 360, unless you qualify for a longer-term visa. 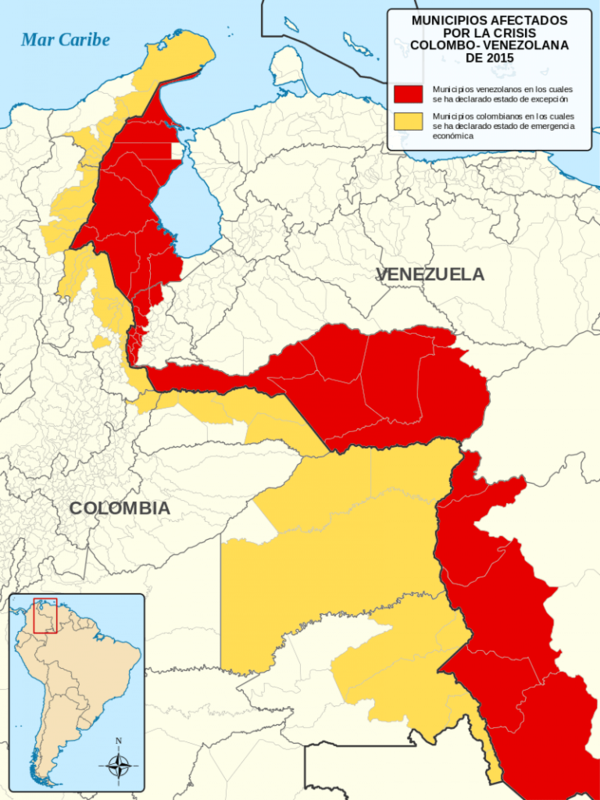 With the recent issues going on in Venezuela and the rise of popularity of Colombia among expats, Colombia immigration officials are extremely overwhelmed right now. After throwing up our hands at the internet cafe next to the immigration office, wherein we were trying to print out forms from their website, (that was not working correctly), we tried one last time to go back in and plead with the officer and see if we could please, pretty please, just get the freaking extension despite missing some various stamps and forms and pieces of paper. We knew that it was all up to the boss on duty at the time and we tried our best “yes sir, no sir” attitude. At this point I instructed Dan to just sit down, smile and NOT say anything except “gracias” when it seemed right. His attempts to point out the “silliness of their system”, although true, was not a productive path to success. Finally at the last minute they called us up, did some stamping and picturing and fingerprinting and we did some paying and VIOLA we were legal for another 90 days. Plenty of time for the longer term visa to come through. Haley was doing her best “don’t bug Mom while she’s stressed” and didn’t ask me what was at stake here if we didn’t get the visas that day. I knew that if the officer wanted to be super picky about our paperwork, we would have to come back the next day to do the process all over again AND we’d have to pay an overstay fine of about $100 per person. That was not what we wanted, but it wasn’t the end of the world. Poor Haley thought that if we didn’t get our visas that day we would be packing and leaving the country very soon. 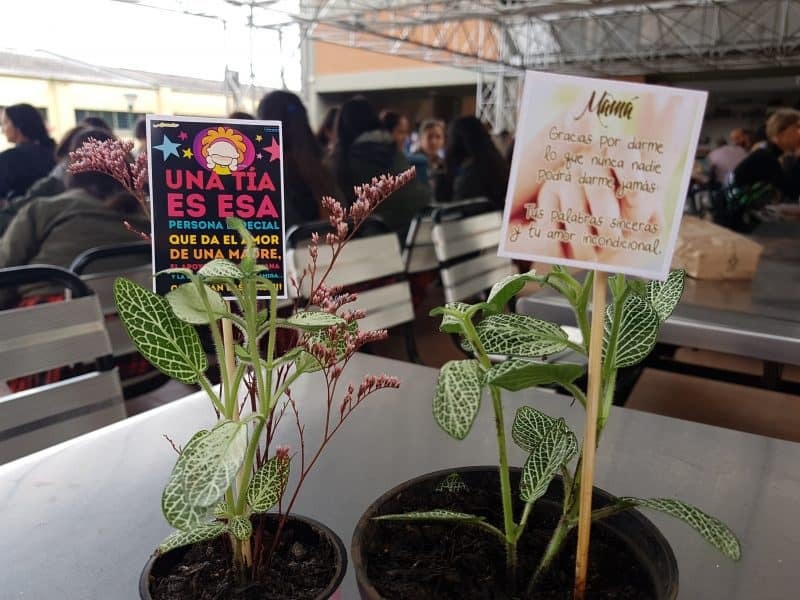 She was already planning how she would get her beloved cacti to her school friend Manuela to care of after she was gone. Once I worked out the scenarios with Haley and she learned “oh, it’s just more money” she relaxed and stopped fretting about her cacti. She’s a good plant mother. While we were going through this whole process, Margaret was enjoying our empty apartment and Jamie was enjoying Margaret. Not content to let her snooze all afternoon (although Margaret would have been fine with that too), Jamie fetched Mar and invited her to happy hour over at her apartment. When we arrived home around 5:30 p.m., Jamie and Margaret were enjoying wine and conversation and declared it to be a great day. So it wasn’t exactly a day exploring the town and entertaining our beloved guest, but it was a day-in-the-life. We’ve spent a fair amount of time working on immigration issues in various countries and this is just part of our Worldschooling experience. Margaret was patient and good-natured. The good news is that since we were able to get our extension, there was no threat of the schedule being disrupted later in the week with any legal stuff. So we happily planned out the rest of our week. The only bad part of the day was I forgot to tell my awesome school taxi driver, JohnFreddy, that I had retrieved the girls from school. Around 2:40 p.m. when I’m sitting in immigration, I get a call from him. He says “I can’t find the niñas!”. Poor guy. I apologized profusely and told him they were with me, and I was so thankful he cared enough to be worried. 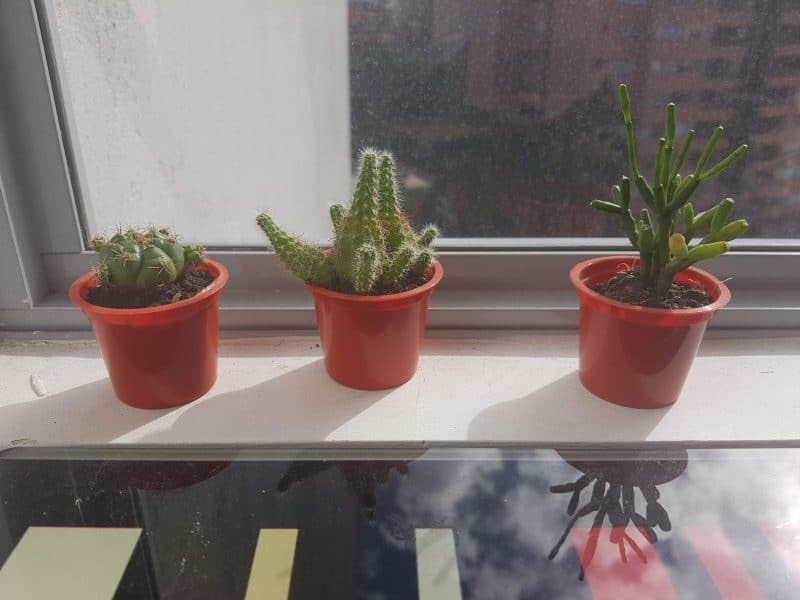 I have no pictures from the day because it was far from picture-worthy, but here are Haley’s cacti, safe and sound in her room. The next day it was time for an outing! Enough of city life, it was time to go exploring a bit. 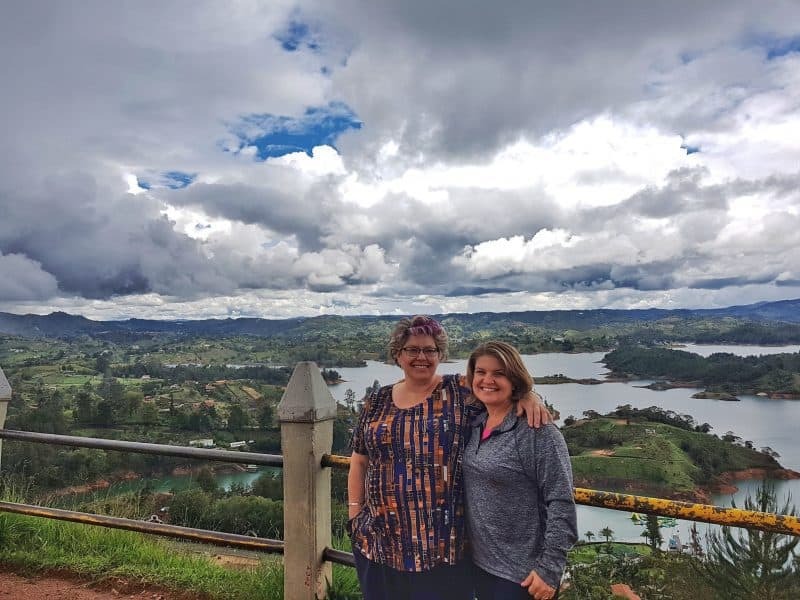 The niñas got off to school, Dan was on tap to take Zoe to her afternoon singing class and JohnFreddy came and got Margaret and me for our trip to Guatapé. 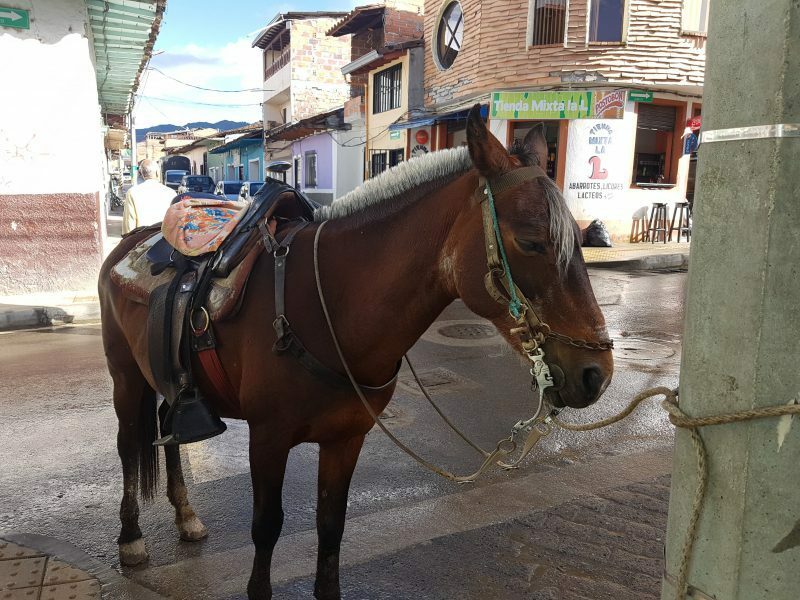 You’ve heard of Guatapé before on this blog – twice. So this time with Margaret is my third visit. I don’t mind going again because each time we go we see something different. In true JohnFreddy style he had researched (read: he asked his wife) about some other places he might take us. So he added a new town onto the agenda. But first, we had to stop at our favorite fruit stand and check out some of the new fruits that Margaret had not seen before. 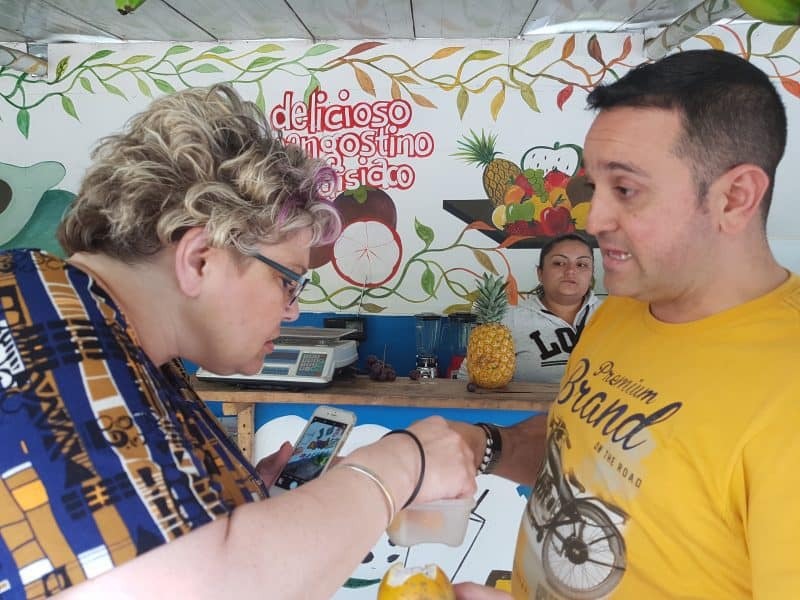 Colombia has so many fruits and fruit stand stops are full of new things! Mar liked most of the things. Some of the things (read: tomate de arbol) are icky until you add salt, then they are yummy. 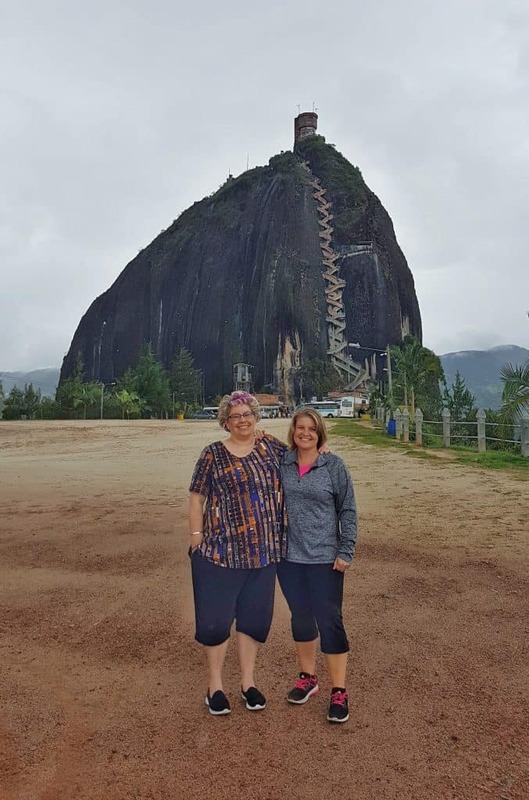 Then it was off to see the big rock that is still under ownership debate between Guatapé and El Peñol. Margaret is deathly afraid of heights and her knees do not like stairs, so she was content to climb only one flight of stairs on the big rock and admire the view. Then off we went to the town of Guatapé. By now it was lunch time so we enjoyed another Paisa lunch, then wandered the streets of Guatapé. She found lots of treasures for friends and family back home. We managed to not get rained on as a bonus! Margaret and I in front of the big rock! Mar took one look at the stairs and her brain and her knees said “no gracias”. Even without climbing the rock, we still got a great view of the area. A small town with pedestrian-only streets and lots of little shops is our happy place. 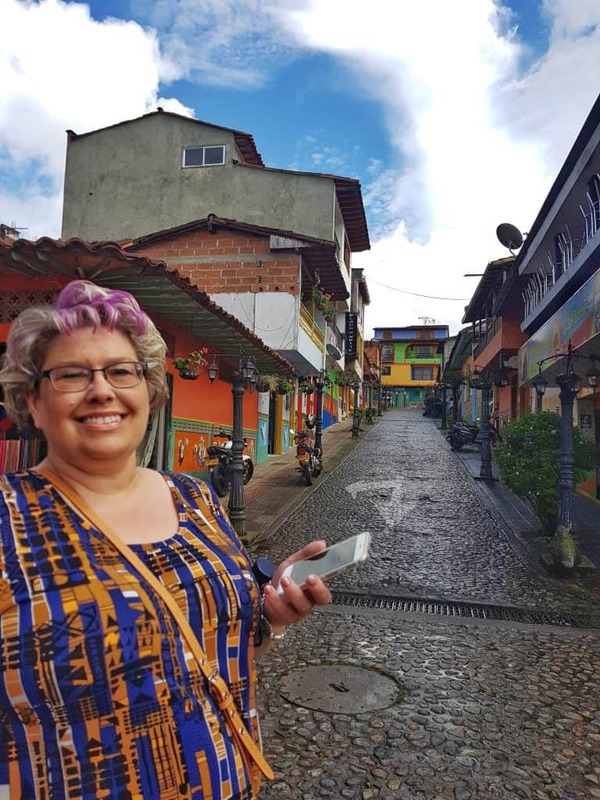 The town of Guatapé is known for their zocolos – the square artwork that lines the streets on the lower half of the walls. We declared this painting “live zocolo“. Sisterly Selfie in front of the pretty church in the main square. 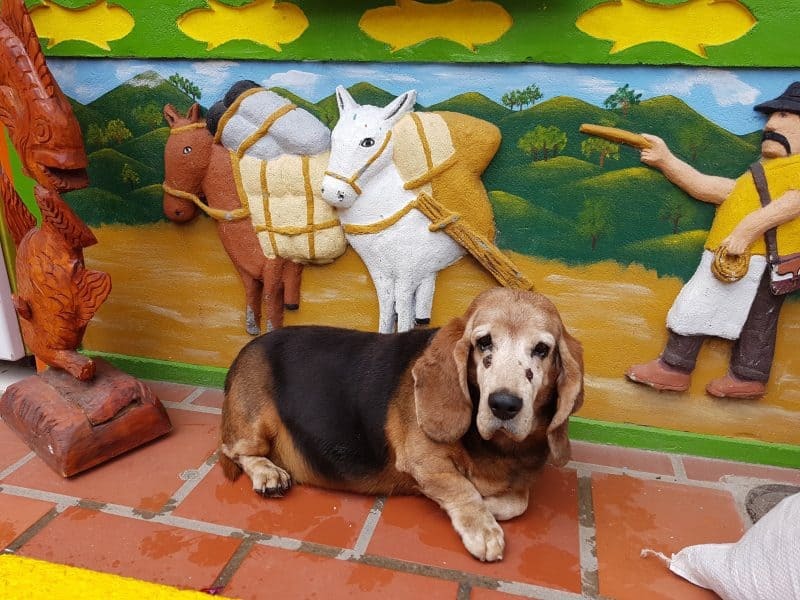 After Guatapé we followed JohnFreddy’s lead and went to Carmen de Viboral. Remember the restaurant from Margaret’s first day in Medellin, when we admired the little dishes? This is where they were made! We were so excited! So we went to the town and walked around for awhile and I declared it an adorable town with lots going on. 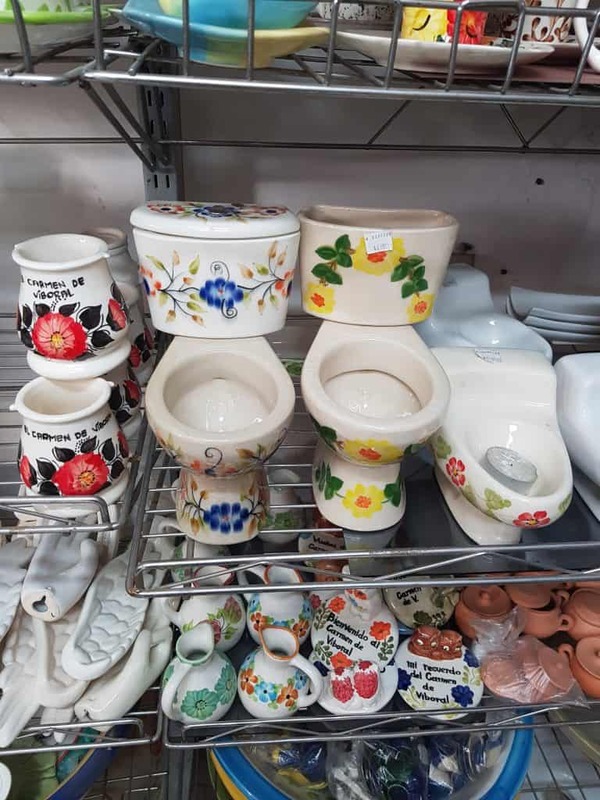 Then we went to one of the bigger ceramic stores and had a great time picking out various gifts for everyone. JohnFreddy is a Worldschooler at heart. While we shopped, he started to talk to the staff about the options for bringing some kids back so they could watch the process of firing and painting and glazing. It’s now on the to-do list! 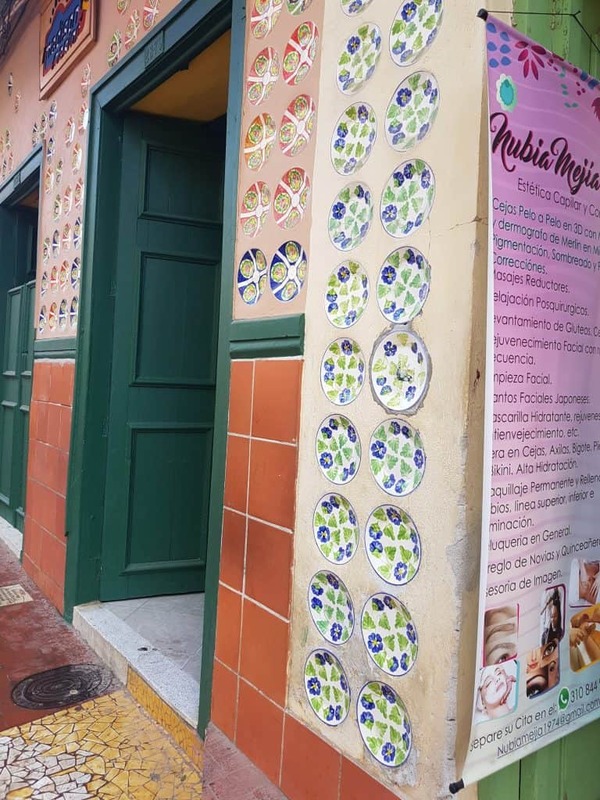 Throughout the town they have plates embedded into the walls. It was so pretty! This is a small town, but very busy with people coming from the nearby fields to do their business. This guy was just parked on a corner, waiting for his owner. 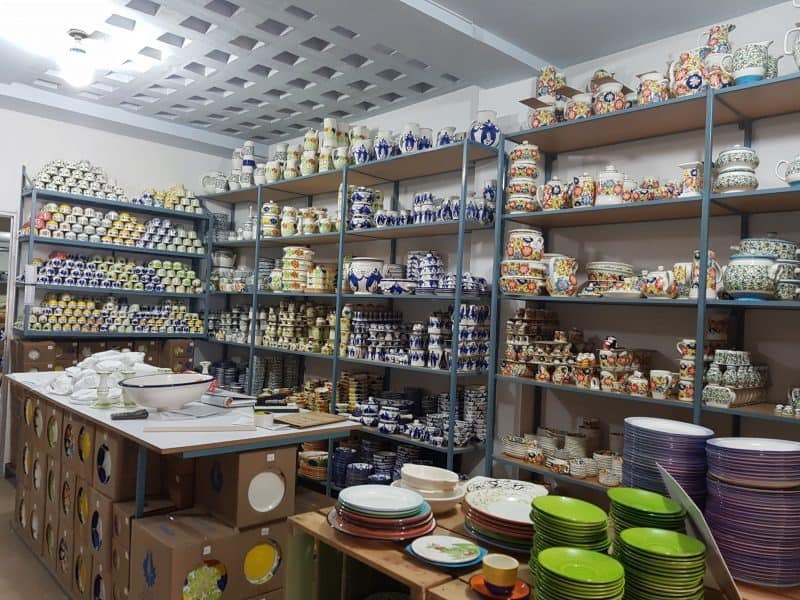 This is the store we found that had the biggest selection of ceramics that are made right there. They were so pretty!!! Margarita Mayo is a happy camper with good selection and good prices! We got a gift for Jamie – Spanish name Jaime. We navigated the traffic to get back home just in time for JohnFreddy to drop us off and pick up Jamie to take her to an appointment. We keep JohnFreddy busy. The next day we had to get up and out of the house by 8:45 a.m.! These Catholic schools do not mess around with sleeping in. It was coming up on Mother’s Day the following weekend and the school was having a special assembly for the mothers. The Sherman girls invited not only me, but Margaret AND Jamie. They are so extra. So we gussied ourselves up the best that we could and hauled ourselves to the school. 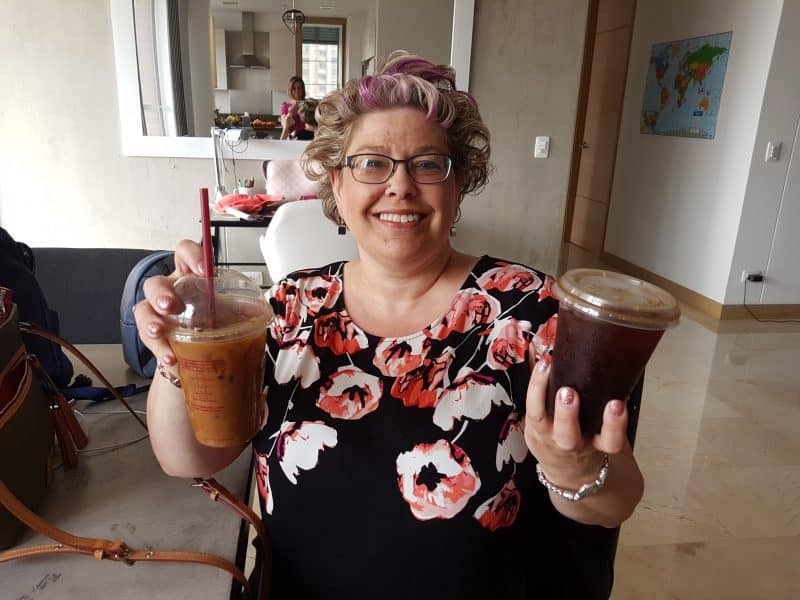 We didn’t have time to get to our favorite cafe before going to the school so we ordered “Rappi do me a favor” and had a delivery service bring us one. But we got a little overzealous and ordered two by mistake. We are so extra. 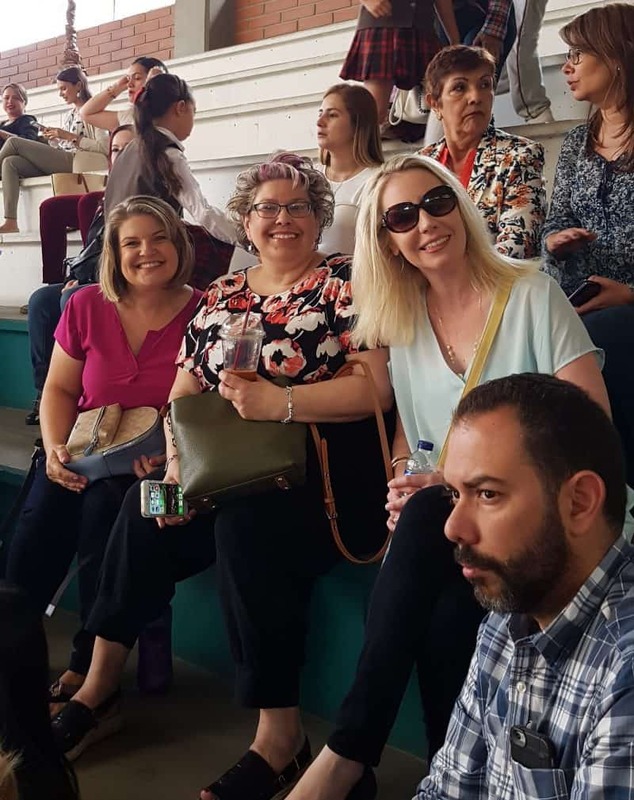 Margaret and Jamie got a tour of the school, we all got some gifts, we checked out the girls’ classroom and then enjoyed an assembly that felt a lot like church while we watched all the gorgeous Colombian moms all decked out in pretty clothes and heels. At the end we signed a pledge not to abuse our children. Plants for moms and aunts! 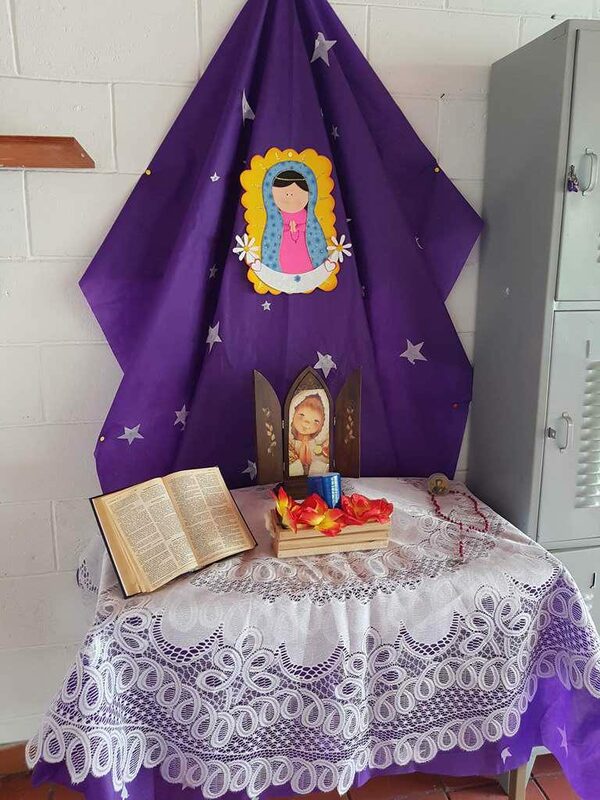 Having experienced public school in the USA for her daughters, Margaret is fascinated by the shrines in every classroom. The niñas are so lucky to have 3 moms that day! After a 2-hour Mass and lots of cheek kissing and best wishes from the staff and the other friendly moms, we were released and sent off to do our own thing for the rest of the day. First stop? Lunch! We had not yet introduced Margarita to our famous Crepes y Waffles (our nickname for it is “Creepy Waffles”) which is a Colombian restaurant chain that serves great things inside of bread bowls. And crepes and waffles, of course. Doesn’t sound very Colombian but it does sound good! 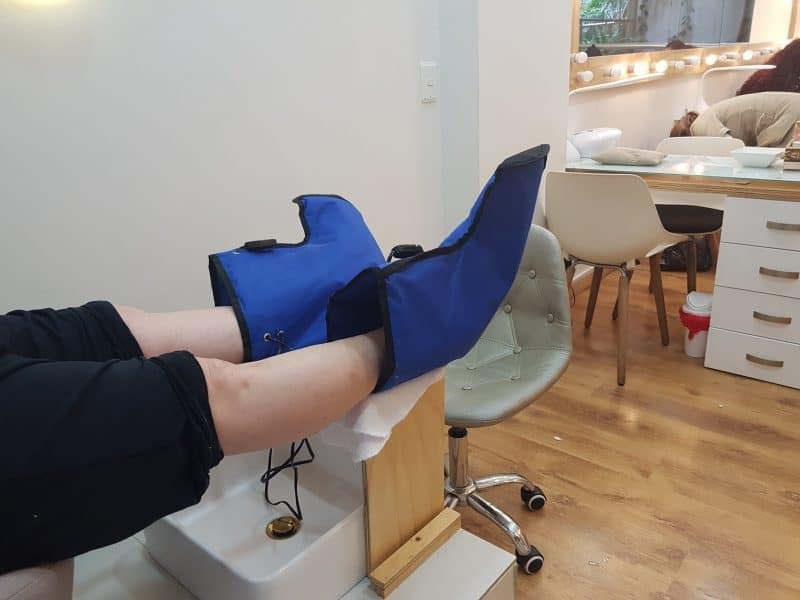 We had a lovely lunch and then found ourselves in pedicure chairs for the better part of 2 hours. This was a perfect treat for busy moms who have to get up early to go to Mass. Pedicures with all the trimmings. By now you might be thinking that Margaret had a great visit. You would be right, but it’s not over yet! Stay tuned for more Aventuras Con Margarita en Medellin. Previous Article Margarita Mayo Comes to Medellin!